Did someone declare a bank holiday and not tell us? "I felt I should have been waving a flag!" What on earth could create this lack of coherence? A steam train would you believe? Ah, but not just any locomotive, no this is the Flying Scotsman. The North York Moors Railway runs through Goathland, our station being the second on the line, one up from the engine sheds and starting point at Grosmont. 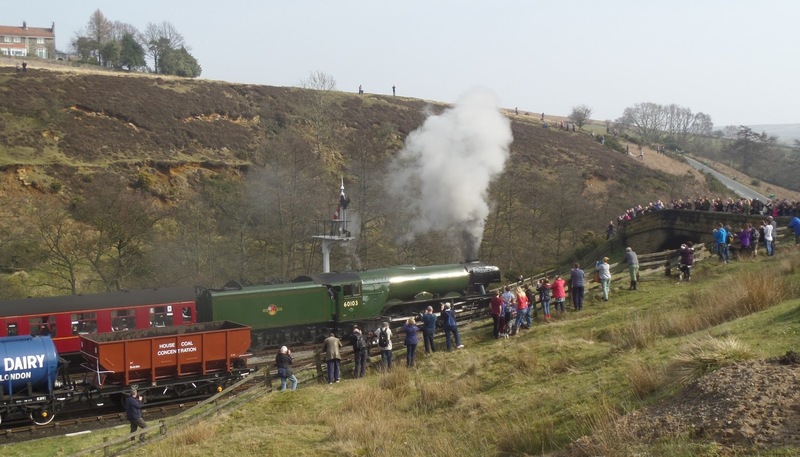 NYMR is the first heritage line to be given the honour of running the Flying Scotsman since her* refurbishment. The locomotive arrived in Grosmont on Thursday evening and on Friday the railway staff were running her up and down the line checking clearances, where she would need to stop in each station and generally getting to grips with operating such an important piece of machinery. With a little local inside knowledge CMH was able to walk down to our station to watch this process and got up close and personal with the loco but silly person that she is, she left her camera at home! Who knows what makes people get all excited? But for reasons I don't quite understand this loco is a very special one, dubbed the Nation's Favourite and the crowds have come out to see her steaming her way across the moors. We knew it was going to be crazy busy and when reports came in of people standing on the tracks to get photos when she traveled to York from London on her inaugural journey the slight worry became almost full blown panic! 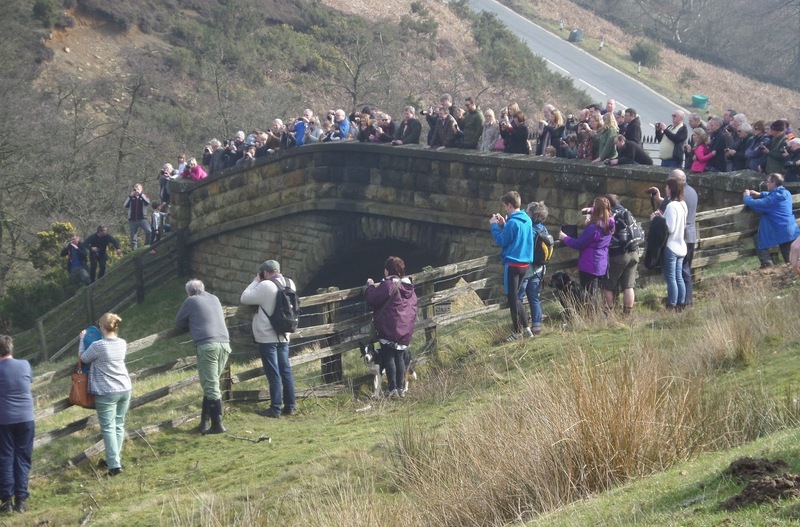 The Railway, land owners and the National Park have all been working together to manage the influx, people have come from as far afield as the Shetland Islands just to get a look and a photo. Tickets for all (except two) journeys during the nationwide Scotsman Season are all sold. Locally it's created an incredible boost for the start of the tourist season, the sums made on car parking and in the station tea rooms alone are incredible. But unfortunately so are the crowds who make life difficult for the rest of us trying to get around and carry on normal life. On Tuesday TB was nearly half an hour late (we were beginning to worry) she arrived full of apologies but she hadn't been able to get across the railway bridge for all the train buffs. CL had similar problems on Thursday morning when she had to sit indicating to turn into the road as people streamed up from the station until finally they began to thin out and she could safely navigate down the lane to the office. It is a road you know! And the train trips themselves have not been without incident with enthusiasts occasionally getting a little too close including a collision with a drone. The last run for the Flying Scotsman is on Sunday evening, then the village has a few days to recover before Easter and the next round of visitors. Despite the problems it's been a successful couple of weeks and the train enthusiasts are generally so happy to be here, ecstatic to see and photograph as much of the train as possible and are a polite bunch to have around. *Locomotives are often (usually) called her or she - for many and various reasons!